At Sweet Themes Bakery, we are proud to offer moist, delicious cakes, freshly baked for you using quality ingredients including an Italian Meringue-style butter cream and high quality butter and eggs. Cakes are customized to your specific request and made fresh to order. Our cakes are 2-full cake layers that are torted (4 layers of cake and 3 layers of filling 4 inches tall) except for full sheet cakes which have only one layer of filling between 2 full cake layers. 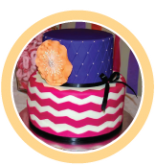 Each custom cake order is presented on an attractive sturdy cake/drum board in the color of your choice to match your cake. We only specialize in ROUND cakes. We DO NOT make carved, shaped, cut out, sculpted cakes or cupcake cakes. See a gallery of our cakes here. When should custom cake orders be placed? We ask for at least one to two weeks’ notice for all custom orders, depending on the level of difficulty and how many servings you are requesting, to be placed on our calendar along with full payment. This is not a guarantee that there will be availability to get your order on our calendar since we are usually booked out a few weeks in advance. We do encourage early ordering to ensure your order can be accommodated and we do our best to accommodate last minute requests when possible. What will the price of my cake be? There are many considerations we look at when quoting a price for your custom cake. In addition to the cake size, we look at the level of detail (labor) required to produce the end result in addition to the amount of time required to make your cake. If the cake is minimal in detail the price typically remains at the base price. However, if there are intricate details and numerous flowers or other custom details the price will more than likely be higher. Standard decoration is included i.e. top & bottom borders, writing, flowers. Other decorating options are available for an additional charge i.e. butter cream piped designs, decorated sugar pearls and sprinkles, fondant cake draping, fondant cut out decorations, gum paste flowers, etc. Please contact us for tiered cake pricing. Yes we are able to make photo edible images on your cake for an additional price, starting at $15. **PLEASE NOTE: Photographs or logos are printed images on edible sugar paper using edible ink from an ink jet printer. Images will be printed “AS IS” from the .jpeg file(s) provided by the customer. We do not have a library of graphics for customers to choose from. We are not graphic designers and do not have the computer programs/capability to change colors, writing fonts, objects, etc. on the provided .jpeg file. Colors may vary from the original picture(s) when printed from ink jet printer. How can I order a custom cake? We recommend filling out our online Custom Cake Quote Form to make sure we get all of the details for your cake request. Filling out an order quote form does not commit you to ordering nor confirms your order. Once your quote form is received Sweet Themes Bakery will make every effort to contact you as soon as possible. Please keep in mind that we might not get to quote requests received on Sundays and Mondays as we are closed on these days. Orders are not confirmed until details are verified, a quote is given and payment in full is received. We are also more than happy take walk in orders or orders over the phone, as long as the order can be completed within a 10 to 15 minute time frame. If it is determined that your order requires more customization, an appointment will need to be scheduled with one of our cake designers. We’re sorry but we are not able to take any orders after 4:30 pm, the last 30 minutes of the day that we are open for business due to closing preparations at the end of the day. All custom orders require payment in full in order to be placed on our schedule, whether your order will be picked at our retail store or delivered. For payment, we accept Mastercard, Visa, Discover, American Express or Cash. Our schedule books fast, and quality custom orders take time to make. In order to avoid any rush fees, please do keep in mind that all custom orders (cakes, cookies, cupcakes, cake pops, cake truffles, etc.) require at least one to two weeks’ notice, depending on the level of difficulty and how many servings you are requesting, to be placed on our calendar along with full payment. If your order inquiry is time sensitive, please call us at 253.981.4999. A rush fee of $25+ (per cake) will be applied if you need your cake within 5 days or less (this includes the day you order). A rush fee of $10+ per dozen will be applied if you need your cookie, cupcake, cake-pop, cake truffle or other custom pastry order(s) within 5 days or less (this includes the day you order). Please be sure you want your custom cake, cupcakes, cookies, cake-pops, cake truffles, etc. before paying for your order. We do not offer refunds, only In Store Credit will be given. Credit amount will depend on when the order has been cancelled prior to your pick up date. When you book an order, we decline other orders. When you cancel your order, it results in lost income just to accommodate your order. Delivery is available only for orders over $100 (not including delivery fee) with minimum one-week notice if available. Our delivery area is from Downtown Seattle to North Tacoma, East to Issaquah; fee starts at $75+ and is based on delivery destination. Delivery in the Downtown Kent area fee starts at $10+ / local Kent area fee starts at $25+. PLEASE NOTE: Some one must be available to accept delivery. Food will not be left unattended. We allow 15 minutes of wait time for recipient to accept delivery. We will call you to let you know what is going on, so please be available to answer your phone.